Ezekiel Bread (also know as Bible bread and fasting bread) is the food that sustained Ezekiel for 390 days in the desert according to the Bible. 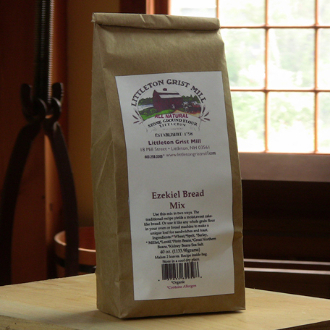 Our Ezekiel Bread Mix is a combination of wheat, spelt, barley, millet, lentils, pinto beans, great northern beans, and kidney beans stone ground right here in the mill. Our recipe is true to the original and makes a moist, sweet, cake-like bread that is literally packed with nutrition. The whole family will love it. Makes two loaves.